One Cartridge , not a box: .45 Raptor, custom made with new brass and loaded with a 230 grain Hornady FMJ (Full Metal Jacketed) Projectile. Loaded with inert powder. 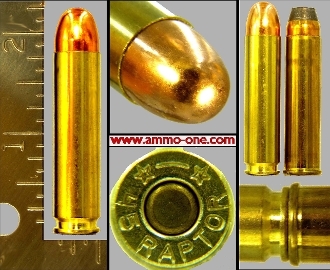 New for 2018 the .45 Raptor was developed by Arne Brennan of North American Sportsman, LLC for us in the AR-10 semi-automatic rifle, by making the 460 S&W Rimmed cartridge case rimless, both of which came for the .308 Winchester case. caliber, out preforming the 450 Bushmaster , 458 SOCOM and 50 Beowulf.